This fizzy pink drink is a kid-friendly, real-fruit alternative to bottled pop. For an adults-only version, add two tablespoons of rum, tequila or citrus-infused vodka to each serving or 1 to 11/4 cups to the batch. In a blender, puree the 2 cups berries and the water. Strain through a fine-mesh sieve set over a bowl, forcing puree through the sieve with a spoon or rubber spatula. Transfer to a 2-quart pitcher. Add the lemonade concentrate and sugar, stirring until sugar dissolves. Chill, covered, until ready to serve. 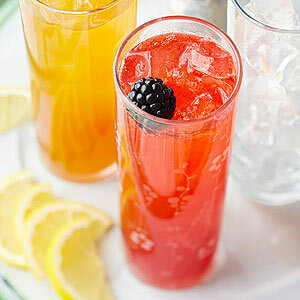 Before serving, stir lemonade, then slowly pour in the club soda. Pour sparkling lemonade into ice-filled glasses. Garnish with lemon slices and, if desired, additional berries.